Born outside of Naples, Italy, Umberto Romano and his parents immigrated to the United States when he was a young boy and settled in Western Massachusetts. Romano's interest in art began at age five and by age nine he was painting. His acceptance to the National Academy of Design in New York City in 1922 marked the beginning of his career as a professional artist. Romano went on to win prestigious awards, including a Pulitzer Traveling Scholarship, which allowed him to tour Europe, studying the masters and creating the foundation for his classical approach to painting. 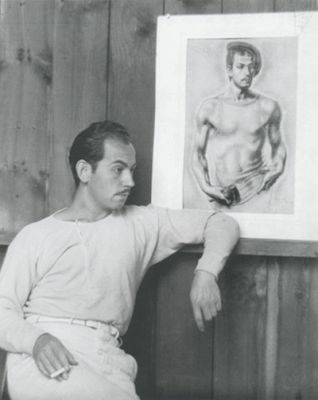 His first one man show was held at Rehn Galleries in New York City in 1928, when he was only twenty-two years old. Romano established a studio in New York City in 1932. During this period, the artist relied on his formal training and his work was inspired by classical themes, often with a contemporary twist. Religion, mythology, legend and history were the frameworks from which Romano constructed modern allegories to explore the human condition. Romano has been labeled an "Expressionist," an "Abstract Expressionist," and a "Classical Modernist." Yet his work defies categorization. Romano himself avoided such classifications and believed that "no matter under what title my work is classified, it will always remain a sincere personal experience, emotionally felt and intellectually controlled." He added that "the artist puts himself into every painting he does. He is something of a filter. He paints what he sees, but it is always filtered through his soul."